Having the courage of one’s convictions is very important in the world that is full of people who judge you at the drop of the hat. When it comes to societal issues like LGBT, child labour, women empowerment, excess service tax, there is always a voice in the wilderness. Written with absolute grit, this novella chronicles the ups, downs, victories and woes of a man who struggles to find a comfortable place in the society. Mr Sharif presents a bold account of his life which also acts as a reminder for people busy in wool-gathering. The struggle involved in explaining the sexual preferences of a person is immense. However, the author’s mother better supported him than the rest. The episodes unfold in brief, just-the-important-events that are easy to follow. The author’s language is sophisticated enough to be authoritative. Right from the first time when the author realized the reason behind his inclination towards the males to the time when he found the strength and will to call a spade a spade and take a stand for himself- this book touches upon some of the most personal accounts of his life. What results is a well-written, newsworthy and truthful work that simultaneously fulfils the need of literary nonfiction in the present age. This further adds to the overall appeal and readability of the book. Barring the printing errors that occur frequently, I cannot deny the fact that this attempt by the author is praiseworthy. We often succumb to the pressures and the standards set by society. What we don’t realize is that we were not born to fit into a club that decides upon the rules based on others’ incapability to be someone else. Being different is a gift; we should treasure it. It is difficult to argue the toss and fight for the right thing but isn’t it better than barking up the wrong tree? 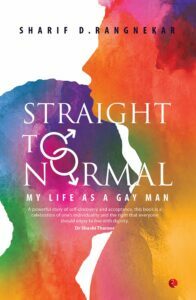 Overall, Straight to Normal is a book written with genuine sincerity. It is sure to give all the readers an insight into the lives of the ones who are always scrutinized and made to feel like a misfit. A must-read indeed!